The taxi driver who has been hired by readers of The Blue Green Power Plant to safely drive the Odd Prowler from his successful speaking engagement in New York City to his safehouse, the home of Bill Duckton in Miami Florida, has Twittered that his Global Positioning Device device has floundered due to an ice-cream spill. "The whole irony of the situation is that we all chipped in so that he would feel safe, after his plane crashed into a luggage cart in La Guardia after taxiing into the tarmac," said Pleasant Sanchez, a reader of The Blue Green Power Plant who donated fifty dollars to help the Odd Prowler get home. "I just wanted him to feel secure and now I can't imagine the terror and anxiety he must feel of being lost on the surface of the Earth." Bill Duckton made allusions to ET, the Extra Terrestial. "No. He hasn't phoned home," he reported. She paid fifty dollars. Big deal. I paid most of the money. Imagine how I feel. Yeah, like I have been swindled. 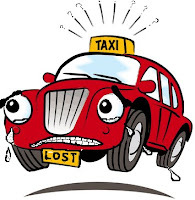 That graphic of the lost taxi just breaks my heart! I, for one, am worried. I know what it is like to be lost. It is no "cruise around the marina." This blog gets a lot of comments. It must be popular. I am going to put it in my favorites. Do taxis actually use GPS devices? I am skeptical about that. I think that is is a typo. I think they mean MPH device, ergo, the speedometer. Hahaha!! Hasn't phoned home!! Good one, Duckton! I am a taxi driver and I never eat ice cream while I am working. I never eat anything while I am working. I am extremely concerned. Why havent we been informed of their well being? Ii is Angela Ramos all over again. 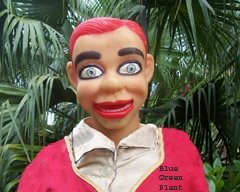 In case any of you tuned in late, she is the Bluegreenplant reporter who disappeared in the Center of the Earth while on an expedition to save Bill Duckton.